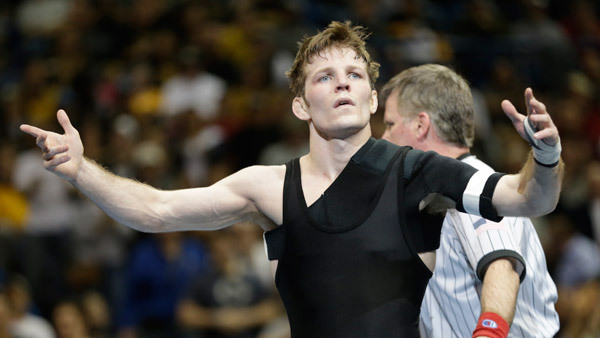 ST. LOUIS -- Iowa's Cory Clark won his first title in his final collegiate bout Saturday night. Clark gutted through a shoulder injury that forced him to miss multiple matches earlier this season to snag a go-ahead takedown with 1:20 to go. He then held his opponent down and held on for a 4-3 win. "Did I ever think it was going to get done? I thought if it wouldn't have got done it would have been a disaster because that was my goal as a senior in high school," Clark said. "And each year I didn't accomplish that it hurt me inside. So to get it done this year is incredible. It means a lot." After the win, Clark sent his assistant coach for a ride. Afterwards, Clark explained that his coach, Terry Brands, wanted him to do it.